Just a heads up that BK has started to get a bit serious about doing some Cisco familiarization. If anyone is interested in Cisco labs or cert study, drop him a line. The lab has some Cisco toys for play as does BK, and some other lab members are network guys by day for very large enterprises in the area. Seems like a good match! 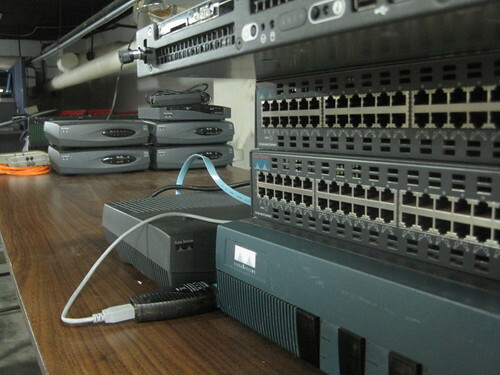 Yes, there is enough routers & switches for others to begin to tinker on their Certification path. I also have training materials to allow self-paced studies. Drop me a line- or catch me at the Lab. Is this class or lab open to anyone? Going after CCNA and would love to join. It’s on Mondays at 7pm in the evening. Thanks. Kyle (and TJ)’s LED Cube Adventures » « Saturday’s electronics class was great!